The definition of rational expressions and their domains are examined. It is clear that the above expressions are undefined if a division by 0 occurs. The domain of a rational expression excludes all values that make the denominator equal to 0.
is the set of all real numbers since the denominator x2 + 1 cannot be 0 for any real number x.
we first have to factor the denominator and find its zeros. 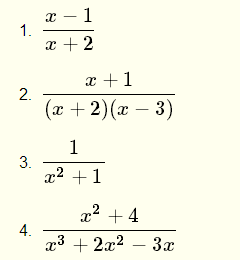 The domain of the above rational expressions is the set of all real numbers except x = 0, x = 1 and x = - 3. 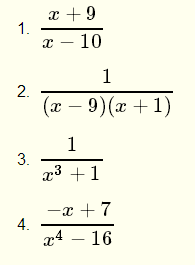 Find the domain of each of the Rational Expressions given below.